Clyde's nursery reveal is coming eventually - I'm trying to decide whether to add some name art to his walls before I write the post, but I thought I'd go ahead and share the quilt I made for him now! I've made quilts for both Wyatt and Gwen, so I knew I was going to make a quilt for Clyde too. I like making my own quilts/crib bedding, because I just usually don't find pre-made crib sets that I really like - this lets me pick my own colors and fabrics. They don't turn out perfect by any means, but I'm not entering it in competitions or anything - I just do it for my babies! I have fun with it! I got the idea for this block-y quilt from this book. I'm not really a traditional quilter (I wouldn't really call myself a quilter at all, really, I just make them when we are adding to our family). I like big, chunky pieces because it's so much faster to sew together! This book has tons of fun ideas for modern-looking designs. I just sketched out how I wanted mine to look, figured out how big all the pieces should be, then I arranged them all on the floor before I sewed them together to make sure I liked the way it looked with the different fabrics and patterns. After I put all the pieces together I took it to my old neighbor who does the actual quilting for me. She picked this cool flame pattern, and I like the way it looks! After I got it back from her I just folded the extra backing over the edges and sewed it down for the border. I really like the way it turned out, and it looks great in Clyde's nursery! I feel like I should come up with a name for the final product, something more interesting. "Baby Boy's Quilt" is a little boring - the colors actually reminded me of the beach, which may have influenced the theme I picked for the nursery. . .
Maybe I'll call it my "Surf's Up Quilt". Or "Anchors Away Quilt"? Or maybe I'll steal the baby shower theme name from Ashley and call it my "Ahoy, It's A Boy! Quilt"! Something like that anyway. Maternity clothes can be pretty expensive. When I'm pregnant, I usually try to find regular clothes that I can make work as maternity clothes, so it cuts down on the cost! I also like doing this because then I have a few things to wear that I don't see on every other pregnant lady in a 50 mile radius, because the selection of actual maternity clothes can be pretty limited. Last year, shortly after I found out I was pregnant, I was shopping and found this tunic shirt for eight dollars. It fit well, but it was kind of an awkward length - too long to wear as a regular shirt, too short to wear with leggings. See? Weird length. But it was perfect for my purposes! So here are the steps I took to turn it into a maternity shirt. 1. Turn the shirt inside out and lay it so the side seam is resting flat. Using an ironing table works best for this step so that you don't accidentally pin the fabric of the shirt together. 2. Take a piece of the elastic and pin one end to the shirt along the side seam, approximately where it would hit your lower ribs. Measure the distance from the sleeve to where you pinned the elastic so that you can keep both sides even. 3. Stretch the elastic as far as it will stretch. Hold it tight and pin it down to the tunic along the side seam until you're 2-3 inches from the hem of the shirt. When you release the elastic it will cause the fabric to bunch up, which will create ruching along the side seam. Cut off any extra elastic after the last pin. 4. Repeat the above steps with the opposite side seam, making sure you start and stop the elastic at the same points as the first side so it will be symmetrical. 5. This is a good time to try on the shirt while the pins are in place to make sure you like where the ruching hits. Just be careful not to poke yourself! 6. Set up your sewing machine. Starting at the top of the elastic, sew a straight line down the middle of the elastic while stretching it straight. Do this on both side seams. And wolla! Your tunic is now a ruched-side maternity shirt! Me and my itty-bitty baby bump. And the shirt with my full 36-week belly! The good part about this is that (at least with the tunic I used), there was enough room created by the ruching that my belly didn't stretch the fabric out too much, so when I'm done having kiddos I could probably remove the elastic and still use it as a regular tunic if I wanted to! Or maybe hem it as a shirt because of that whole awkward length issue. . . .
Let me know if you try this, I'd love to see how your shirt turns out! So I officially finished the crib bedding for baby girl! Eventually I will post pictures of the nursery so you can see it all together, but for today I'll show you all the quilt. The finished product! It was really hard to take that second picture by the way - I had to stand on a chair and hold the camera above my head. I need to be taller I guess! I had no idea what colors I wanted gong into the fabric store - whether I wanted to be traditional or go for an unexpected color scheme. But in the end I put all these fabrics together and loved it, so muted pinks, purples, gold, and white it was. I think it was a good way to go in the end, because with all the different shades of pink and purple, I haven't had too much trouble finding crib sheets and decor items to go with the color scheme! It was a pretty simple patten to follow - basically you start out with a base piece, cut out a bunch of squares, arrange them on the base piece, then pin them into place and sew with an appliqué stitch around all the edges. I changed it up a little bit from what the book suggested and added the borders around the edges, with the pieces overlapping onto the border. One of the out-takes from my attempt at getting a picture of the whole quilt, but you can see the edge better in this one. One thing I might do differently if I were to do this quilt again would be to place the pieces one at a time and sew them down before adding more squares on top. The advantage to doing it that way would be that the pieces would all lay flat - it was hard to keep all the pieces exactly in place while I was sewing, since I don't have a quilting table, so some of them ended up a little puckered. The disadvantage to doing it that way though would be that you can't really get a full picture of the placement before you start sewing, which is why they probably suggest to arrange all the pieces from the start. And I'm happy with the way it turned out, puckers and all - it may not be perfect, but a lot of love went into it, and that's the whole point of making my baby girl a quilt myself. 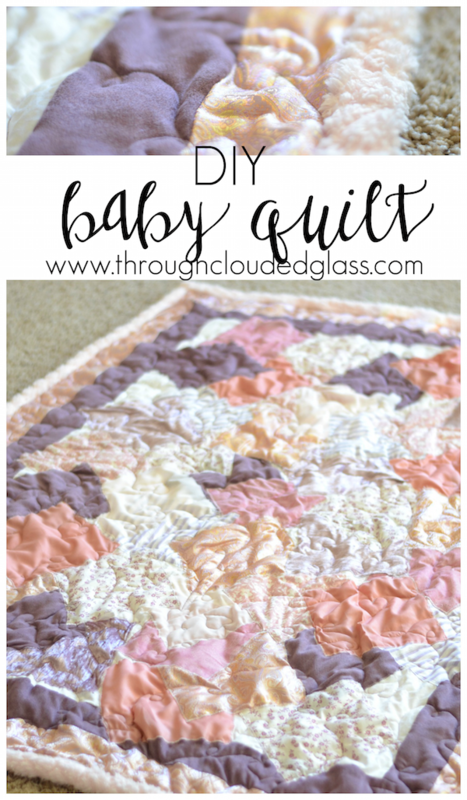 When I make baby quilts I like to pick simple designs with large squares - I'm not a die-hard quilter, not yet anyway, and I need something that I can start and finish rather quickly. This quilt probably took me probably 10-15 hours all together maybe? Including cutting the pieces. I don't think that's bad for a quilt. I did not, in fact, do the actual quilting part myself - once I had it pieced together I took the back, front, and batting over to my old neighbor, Debbie, who has a professional quilting business and a big, fancy machine to do it with, so she did that part. If I didn't have Debbie to do the fancy quilting for me, I'd probably just tack it down in several places or do simple lines instead. I love the meander that Debbie picked by the way - see the little hearts in the stitching? It's perfect! When I got it back I did the biding around the edges by just rolling a bit of the backing around the the front, then pinning it and sewing in place. And that's it! I also made a crib skirt to go with it, and I'll show you all of it together once we have Mr. Wyatt transferred over to his toddler bed and I get the crib set up! The first signs of my nesting came through earlier this year, when I decided to save my bonus money from work in order to re-do my living room. Tough I don't think I can legitimately claim that as nesting, since it was before I got pregnant - but it was definitely time for some new furniture. I neglected to take "before" pictures, but I used to have these coffee tables that had iron legs, and wood-and-glass tops. The furniture looked nice enough, but it wasn't what I really wanted - I just got a deal on it back when I was trying to furnish my brand-new house before I got married. After we had Wyatt I realized just how frustrating glass table-tops can be - there is just no keeping them clean. Note the adorable toddler in that last picture . . . he completes the look, no? I really like the way it turned out! The colors are bright and distinct, and they all match (well, not exactly, but they go). I feel like it gives it a more intentional, less we-just-got-married-and-are-using-what-we-have look. I also did the colored bottles and pillow covers myself, and I like they way they turned out! More on the bottles in a different post. The next project is saving for furniture for the family room downstairs. But that one won't be happening for a while - new baby coming, you know, so the kid's room takes precedence! I’m finally getting around to posting the projects I’ve been working on! I’ve mostly been working on skirts for the summer. Here is what I’ve made, and I love the way everything turned out! This skirt I made is reversible – one side is white and one side is mint-colored (it’s hard to tell in these pictures, but trust me, it’s the truth). It worked out well, considering both the fabrics I wanted to use were see-through when used by themselves. And I made the skirt in such a way that it’s totally do-able as a dress too. I’m not so into strapless, but with a sweater it’s cute. I also made a dress using this tutorial, but I’m not crazy about the way it turned out, so I’m not going to share it in this post. I may change it back to a skirt in the future. We’ll see. I got the inspiration to try making the first skirt from my friend Ashley! She made a skirt form the same tutorial, and I thought it was so cute. We put both our skirts on one day for a picture together – they both turned out good! Ashley tweaked the tutorial a bit (just like I did), so her skirt turned out a bit different too – maybe I’ll have to talk her into doing a post on what she did so you all can see. If you want to make a similar skirt to one of mine, I recommend reading through the above tutorial carefully first, because that’s the basis that we used for all of these. However, I did change it up a bit from what the tutorial said, so I’ll cover where the instructions for my skirts varied below. 1. Follow the directions for the above tutorial, except when you cut out your pieces, make two sets of skirt pieces – one set for each color you are using. 2. When you cut out the waistbands, instead of cutting four pieces out of the same color, cut two pieces out of each color you are using. 3. Sew the waistband pieces together as directed, except make sure that you sew the opposite colors together – so when you unfold the waistband piece, one side will be with one color fabric, and the other side with the other color. 4. Skip Step 9 for now. 5. Once you have the waistband pieces sewn together, sew the waistband piece to the skirt piece as directed – just make sure you use a matching skirt piece to the matching side of the waistband. What you’ll end up with is a long, hourglass-shaped piece of fabric, half one color, half the other color. Repeat with the other pieces. After you’re done you will end up with two pieces of fabric like the one I drew above. 6. Lay both pieces on the floor, right sides together and matching colors together, and pin up the sides. Then sew down each side with your sewing machine. 7. After that you can turn your skirt right-sides-out, and you’ll see how it can be reversible! Your rough seams should be on the inside of each layer, so you shouldn’t be able to see them with either color. 9. Then you can stitch around the top of the waistband to finish it off. You may also want to do a stich around the bottom of the waistband as well, just so it doesn’t slide around when you are wearing it. And you’re done! This is where you can also even up the edges of the bottom of the skirt and hem it, which I actually never got around to (you can see the white peeking through around the hem of the mint-colored side of my skirt). 1. Follow all the instructions for the tutorial, just make it longer. 2. I also made my waistband much thicker than the suggested width – I did 8 or 9 inches for the width of my waistband, because I wanted the place where the pleats start to be visible below the line of my shirt. If you want the option of wearing it as a dress you’ll want to do the thicker waistband too. 3. However, no matter the width of your waistband, I recommend not sewing the bottom edge of the waistband until after you sew the sides together. Then you can fold the loose end of the waistband down and sew around the perimeter of the waistband to secure it afterward. The inside waistband piece pictured above is the piece you will fold down and stitch in place after the sides are sewn together. If you do it this way, then you can fold the waistband down and it’ll still look like it’s the right side out – the rough side of the seams won’t be visible, because you hid them on the inside. This is nice, because it gives you a little more flexibility on where the top and bottom of the waistband hit on your hips, because if it’s too high or low you can just fold it down so that it hits where you want, and the inside seams won’t show. It’s also nice if you want to use it as a maternity skirt, because it gives you more of a waistband to work with! 4. Keep in mind with all of these instructions that your elastic thread will be on your bobbin – so whatever side of the fabric is facing up is the side that will have the regular thread, the other side will show the elastic thread. So if you are sewing the waistband in place, make sure the elastic thread is on the side that is less visible, especially if you are using a dark color. It doesn’t look bad if it shows, but you might want it on one side of the skirt or the other. So just be strategic about it. And that’s that! Let me know if you have any questions, and check out the tutorial I linked to above – otherwise none of these directions will make sense.